than starting with a stack of cards to play with (ie Magic: The Gathering), players start with a very small deck of cards. These cards each have a value and players spend this coinage to buy more cards into their discard pile. So the next time they shuffle their deck, the player has more options for attack and defense. In between buying cards, players use their ever-growing might to crush other players. Too many card purchases or too much attacking leaves you victory point or card poor. It is this constant balance between development and combat that drive the strategy for deck-building games. 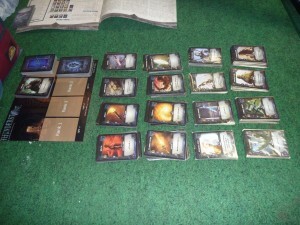 Another aspect of a deck-building games are options. I will explain this a bit more later, but there are many types of cards in the box, some of which are not used for every game. Players either decide which cards to use during the game or there is a random draw option, so neither player chooses their favorite cards. Unused cards stay out of play. This configuration change for every game keeps the game “fresh” and tends to stave off the “one good strategy” every player uses that kills many games. .” AEG is known for their quality production values and “Thunderstone” is no exception. The box and cards are top-notch and the interior box organizer keeps the cards organized. Included oversized separator cards keep the various flavors of cards separate. As to the art, I thought the card art very good throughout and fed the dungeon-crawling theme nicely. I ran my review game with only two players, but the game supports up to five players. Each player draws six cards and reveals them in turn. In the first round, you might have enough to fight a very small monster in the dungeon, but most likely you will buy something in the village. Some cards in your hand have a gold value on them, so you add up your gold for that round and see what you want and can afford in the village. The village is the four rows of cards below the “Dungeon Hall” board. The village is essentially a big shopping mall for adventurers. Each turn players choose to either go to the village and purchase equipment and heroes for their deck or use experience points for hero upgrades. So, as a first turn you buy the “barkeep” and add him to the discard pile. After a reshuffle and a fresh draw, the “barkeep” is available for the player. Strategy comes from knowing what and when to buy something and you have only the gold in your current hand. ” plays a bit like “Munchkin.” Problem is, you never really know what you will get on each draw. It is quite possible to get very little (or no) offensive firepower. Or the weapons are too heavy for your hero and you cannot use them. There is also the “light” mechanic. Depending on where the monster resides on the “Dungeon Hall,” there is a light penalty associated with that space. Mechanically it means you need either extra attack strength to destroy the monster or items that generate light to overcome the penalty. Early game, I found myself buying anything that threw light to remove this penalty. I was never so happy to have torches in my entire gaming life! Defeat a monster and add him to your deck. You also receive experience point cards, useable in the village for hero upgrades/leveling. Beware! Some creatures give you diseases or other ongoing effects that definitely impact your long-term strategy, so stay alert for special powers. As the monsters fall to the heroes, the monster draw deck shrinks until the “Thunderstone” appears. 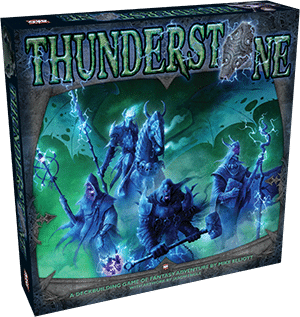 Once the stone reaches the first field of the “Dungeon Hall,” the game ends. It is possible to claim the stone for some extra victory points, but it is not required to end the game. Players go through their decks, add up the victory points listed on the cards and high score wins. .” The game mechanics are clean, simple and straightforward. Most importantly, for me anyway, I got a kick out of the dungeon crawling theme. I am going to give it a run with my regular gaming group in-between RPG sessions. Remember game mechanics require very frequent deck shuffles. Card protectors are, in my opinion, required. Have fun storming the dungeon! Full Disclosure: I received a review copy of this game from AEG. This sounds like the game Dominion. March 29, 2017 trask Comments Off on Crit Hit Offers Free Badge and Cash for Phoenix Comicon 2017 RPG GMs! January 11, 2012 trask Comments Off on Vul-Con Trophies Are Amazing!